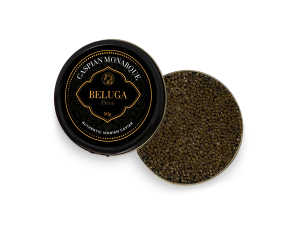 Beluga caviar was the favored delicacy of the Shahs of Persia and the Tsars of Russia respectively, Beluga has remained the ultimate in luxury, a culinary experience like no other on earth. 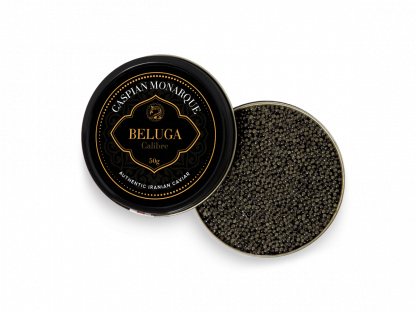 So, our Calibre Beluga pays homage to this esteemed history, offering you the pinnacle of Caspian caviar, abundant in flavor and overflowing with those divine and tempting aromas. Your senses will be transported to paradise, as the soft and sumptuous pearlescent grains pirouette over your tongue. A fresh roe that combines the ebullience and excitement of youth with the refined qualities of age, our Calibre Beluga is rich in that distinct Persian and Caspian character that is so loved by so many caviar connoisseurs. The definition of opulence, this caviar is a masterful Caspian dream, a true blessing from mother nature.